The clergy sexual abuse scandal has left us stunned and confused. But crisis in the church is not a new phenomenon. One of the most important spiritual resources in times of crisis in the church has been Scripture. Two items in this year’s roundup of books on the Bible deal explicitly with Catholic biblical interpretation. Others treat the Psalms, music in ancient Israel, Old Testament theology and Luke’s Gospel. And one other will be an especially good read around St. Patrick’s Day. The Scripture Documents: An Anthology of Official Catholic Teachings (Liturgical Press, 352p, $29.95, paper; 0814625916) edited by Dean Béchard, S.J., is intended to provide easy access to those official conciliar, papal and curial documents that record the Catholic Church’s recent efforts at promoting and guiding the study of the Bible among the faithful. While focusing on documents from the late 19th and the 20th centuries, it also includes selected documents that reflect the church’s understanding of the Bible beginning in the 16th century. The conciliar documents are various decrees from the Council of Trent and excerpts from the First Vatican Council’s Dei Filius (1870), as well as the full text of the Second Vatican Council’s “Dogmatic Constitution on Divine Revelation” (Dei Verbum, 1965), surely the most authoritative and important text in the book. The papal documents include encyclicals by Pope Leo XIII (Providentissimus Deus, 1893), Benedict XV (Spiritus Paraclitus, 1920) and Pius XII (Divino Afflante Spiritu, 1943), along with various addresses by Pope John Paul II. Among the curial documents, the most important from a historical perspective are the (now breathtaking) responses from the Pontifical Biblical Commission in the early 20th century, and its more recent (and most illuminating and helpful) statements on the historical truth of the Gospels (1964) and on the interpretation of the Bible in the church (1993). Béchard, professor of New Testament at Fordham University, has selected the documents, provided fresh translations in many cases and supplied extensive bibliographies. He has also written a 12-page appendix that places the early responsa of the Pontifical Biblical Commission in their historical context (the battle against Modernism) and shows how they have been modified over the years. A two-page foreword by Joseph A. Fitzmyer, S.J., introduces the collection. 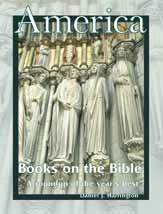 The authoritative texts gathered in this anthology will be of great interest not only to biblical specialists, theologians and church historians but also to anyone who wants to understand what Catholics think about the Bible (see especially Dei Verbum) and how they interpret it (see especially the Pontifical Biblical Commission’s document on the interpretation of the Bible in the church). According to Luke Timothy Johnson and William S. Kurz, S.J., in The Future of Catholic Biblical Scholarship: A Constructive Conversation (Eerdmans, 299p, $24, paper; 0802845452), the future lies in recovering the past. Johnson, professor of New Testament at Candler School of Theology at Emory University, contends that Catholic biblical scholars should apply themselves more to the history of biblical interpretation in general and to patristic exegesis in particular. Kurz, professor of New Testament at Marquette University, argues that Catholic scholars need to attend more to the biblical roots of Catholic “issues” (sacraments, pro-life concerns, the unity of Scripture, etc.) and to stress the continuity between Scripture and Catholic Church doctrine. Each author presents five essays plus a response to the other’s essays. Johnson treats what is Catholic about Catholic biblical scholarship, the value of conversing with biblical interpreters from the first 1,600 years of the church’s life and imagining the world that Scripture imagines. He also contributes papers on two great patristic biblical interpreters and theologians: Origen on the transformation of the mind and Augustine on the demands of charity. Besides his substantive and welcome treatment of the biblical foundations of pro-life positions, Kurz provides four investigations of passages from John’s Gospel and their significance for Catholic life today. They concern: moving beyond historical criticism (reading John’s Prologue as Catholics); bread of life in John 6 (intertextuality and the unity of Scripture); feeding the 5,000 in John 6 and the Eucharist (spiritual senses and actualization); and “whose sins you shall forgive” in John 20 (applying Scripture in the Catechism of the Catholic Church). The volume closes with responses by both authors to 10 key questions pertaining to the present and future of Catholic biblical scholarship. The positive and constructive proposals made by these two distinguished Catholic biblical scholars are sound and welcome, and their essays demonstrate wide learning and sensitivity to the problems and possibilities of biblical interpretation. But their suggestions are not as revolutionary as their book may appear to suggest. Indeed, many Catholic scholars have been doing these things for years. Moreover, both authors seem to be too negative about the current state of Catholic biblical scholarship. They pivot between acknowledging “historical criticism” as a necessary first step in any biblical study and viewing it as a remnant of the Enlightenment that has corrupted Catholic biblical scholarship. Yet almost all their examples of the evils of historical criticism come from liberal Protestant sources. The authors are also strangely neglectful of the great accomplishments of modern Catholic scholars in illumining the biblical text and its world. Most Catholic biblical scholarship today is both respectful of the text and theologically responsible and enlightening. Indeed, “historical criticism” in the hands of Catholic biblical scholars generally achieves an admirable balance between Wissenschaft and theology/spirituality. An excellent example of what modern Catholic biblical scholarship is and should be can be found in Psalms 1-72 (Abingdon, 338p, paper, $28; 068702711X) by Richard J. Clifford, S.J., my colleague at Weston Jesuit School of Theology. His volume is one of the first in a series entitled “Abingdon Old Testament Commentaries,” an interconfessional project directed by Patrick D. Miller intended to help readers to understand more about the origin, character and meaning of the Old Testament writings and to enter into their own informed and critical engagement with the text for themselves. In his 21-page general introduction, Clifford provides a helpful framework by treating the Psalter both as a book in the Bible and as a reflection on the ancient Jerusalem Temple and its worship, the genres and rhetoric of the psalms, the major theological themes, and possibilities and problems for using the psalms in prayer today. The heart of this volume is the treatment of each psalm in the first two “books” of psalms (1-41 and 42-72) according to the same threefold pattern. The literary analysis deals with language and images, structure and literary form. The exegesis goes in some depth into the contribution of each verse or section to the psalm as a whole, and notes related biblical texts. The theological and ethical analysis includes issues of theology and spirituality, Old Testament parallels and influences on the New Testament, and the history of interpretation. This volume is both an excellent example of modern Catholic biblical interpretation and an auspicious start to what promises to be a fine tool for opening up the riches of the Old Testament. A second volume covering Psalms 73 through 150 has been completed and will appear very soon. For those who study the psalms and/or pray with them either communally or in private, Clifford’s expositions will be a precious resource. Joachim Braun’s Music in Ancient Israel/Palestine: Archaeological, Written, and Comparative Sources (Eerdmans, 368p, $30; 0802844774) is an eloquent example of the power of archaeology to illuminate the culture of antiquity. Indeed, it is a remarkable combination of musicological erudition, mastery of the pertinent archaeological evidence and skilled interpretation of iconographic and literary evidence. As Braun, professor emeritus of musicology at Bar Ilan University in Israel, admits, “Neither sound nor musical notation remains of the music of ancient Israel/Palestine.” Nevertheless, he maintains that from sources recovered by archaeologists—musical instruments, terra cotta and metal figures, etched stone illustrations, mosaics, lamps, coins, etc.—it is possible to learn a great deal about music in ancient Israel/Palestine from the Stone Age through the Hellenistic-Roman period. The focus of Braun’s book is not music in the Bible or music in biblical times but rather music in ancient Israel/Palestine. Nevertheless, he does provide by way of introduction a careful analysis of the terms used for musical instruments in the Old and New Testaments. And, of course, in the latter parts of his book Braun integrates the literary evidence found in the Bible with the relevant archaeological material. Music has been part of human civilization from earliest times, so much so that Braun can speak of an overall “acoustic revolution” and even a professionalization of drummers and harpists during the Chalcolithic period. The Bronze Age (3200-1200 B.C.) material shows a rich variety of musical instruments (lyres, drums, lutes, noisemakers, rattles, cymbals and flutes) and the heavy influence of Canaanite musical culture. The Iron Age (1200-587 B.C.) evidence, which corresponds to the content of the Old Testament historical books, adds to the array of ancient Near Eastern musical instruments and to the many life-settings in which music was featured (and even the emergence of the orchestra). The Hellenistic-Roman period (4th century B.C. to 4th century A.D.) brought with it “an entirely new musical world” and even “the golden age of music in ancient Israel/Palestine.” The archaeological evidence also points to the popularity of the cults of Dionysus and Pan even in some Jewish and Christian circles. The longstanding debate about the unity or the center of Old Testament theology has not produced many solid results. In Theologies of the Old Testament (Fortress, 358p, $30; 0800634659), Erhard S. Gerstenberger contends that the Old Testament has no unitary theology, and that rather than being a disaster, the plurality of the Old Testament witness is “an extraordinary stroke of good fortune.” Gerstenberger, who has taught Old Testament literature and theology in Brazil and at the University of Marburg in Germany, approaches the biblical texts from the perspective of contextual theology. He is concerned with the various social-historical contexts in which the Old Testament materials took shape and with the various social-historical contexts in which it is read today. He nicely combines the critical analysis of texts that has been characteristic of German biblical scholarship and the social-pastoral perspectives championed in Latin American liberation theology. The heart of Gerstenberger’s work is showing the correlations between the social settings of the biblical material and the images of God and ethical concerns that they fostered. In the elementary context of the family and clan, people looked to God for their basic needs: food, descendants, health, clothing, dwelling place and group harmony. In village life there was great emphasis on God’s presence in a specific locale, God’s care for nature (agriculture and livestock) and obligations to be peaceful and to care for and respect one another. In the tribal alliance (Judges) Yahweh makes his appearance as the warrior God and as the defender of the threatened tribes. During the monarchy this same Yahweh was celebrated as king and just judge and served to legitimate and restrain the kings. And in the Babylonian exile and afterward, in what became the faith community of “Israel,” Yahweh is the universal God of heaven, and the ethical teachings from all the earlier strata are integrated into what emerged as our Old Testament. This book provides a fresh and imaginative approach to biblical theology. It is well founded historically and sociologically, and at the same time it is theologically challenging without being reductionist. Its sensitivity to the different contexts both in biblical times and today can contribute toward developing a contextual and ecumenical theology in the postmodernist world of the 21st century. Luke’s Gospel has been described as the most beautiful book ever written. For those in search of a scholarly but accessible guide to its interpretation, François Bovon’s Luke 1: A Commentary on the Gospel of Luke 1:1—9:50 (Fortress, 440p, $59; 0800660447) is an excellent starting point. In his preface, Bovon, professor of the history of religion at Harvard Divinity School, proposes to examine Luke’s Gospel “with the sober reserve of a scholar and with the confidence of a believer.” He also states his conviction that genuine understanding of Scripture becomes possible “only if God leads me to his word.” He describes Luke as a theologian of God’s word, who developed his Christology, eschatology and ethics in the context of relationship with Christ and with people who participate in the church and remain loyal to the Gospel. These days full-scale biblical commentaries tend to be so detailed and encyclopedic that they generally serve only as reference tools. While Bovon’s work is an excellent reference volume (part of the Hermeneia series), it is written in such a smooth and simple style that its main text can be read straight through. In his expositions he offers many theological insights that teachers and preachers will welcome. At certain points—for example, on the relevance of Jesus’ teaching about love of enemies and nonviolence in an increasingly dangerous world—he illustrates nicely how to struggle with the problems involved in actualizing New Testament texts. Almost every commentary section contains a summary of the major theological and homiletical points, and many provide a brief history of interpretation that surveys how the text has been interpreted and what effects or influences it has exercised. Extensive notes at the foot of the pages deal with ancient parallels, philological issues and debates among scholars. In a fascinating, if hypothetical work, Irish Jesus, Roman Jesus: The Formation of Early Irish Christianity (Trinity Press International, 280p, paper, $24; 1563383853), Graydon F. Snyder contends that the Jesus tradition was implanted in the Celtic world through the Pauline mission, was carried by Celtic peoples as they were pushed further to the western regions of the Roman empire, reached Ireland by way of Spain (Galicia in particular) and produced a form of Christianity quite different from the Roman kind. The key New Testament document is Paul’s Letter to the Galatians. There is a longstanding debate among biblical scholars whether Paul addressed Gentile Christians in the Roman province of Galatia (in present-day central Turkey) or ethnic Galatians/Celts (the North Galatia hypothesis). Snyder opts for the latter destination and gives a fresh reading of Paul’s letter as addressing the virtues and problems of ethnic Celts on the outskirts of Roman civilization. He insists, however, that Celtic Christianity, despite its Pauline origins, was not particularly Pauline in its theology. Rather, he argues that the Jesus tradition preserved in the Sayings Source Q, Mark and the Gospel of Thomas supplied the bulk of the content. The main concern of this work is to describe how the Jesus tradition was received in the Celtic world as this can now be known from Ireland and related areas. The most convincing and least speculative chapters consist of comparisons between the Celtic and the Roman approaches to depicting biblical characters and motifs in sculpture and other art forms. Snyder also marshals evidence from literature, calendar observance, piety and theology (with a spirited defense of Pelagius). Both an exegete and an art historian, Snyder concludes that an “example of the original, oral Jesus tradition exists in Ireland, collected before it could have been written, entering a completely oral culture, essentially out of touch with the Greco-Roman world.” After an enjoyable reading spent cheering on the author through the various parts of his book, I put down the book with some skepticism about how well the case as a whole stands up. But at the very least, Snyder has produced a fascinating work of “virtual history,” of what might have been, even if all the pieces in his overall theory are not fully convincing. The biblical writer known as Ecclesiastes (or Qoheleth) observed that “of making many books there is no end.” The recent publications discussed here illustrate the breadth of topics and variety of interpretive approaches current in biblical studies. After thousands of years the biblical word continues to flourish. This article also appeared in print, under the headline "The Word Flourishes," in the March 17, 2003 issue. Daniel J. Harrington, S.J., is professor of New Testament at Weston Jesuit School of Theology, Cambridge, Mass., and editor of New Testament Abstracts.